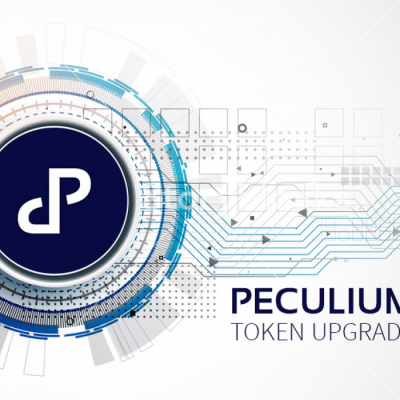 Is an All-in-one platform that has been created by Peculium in order to provide our investors/community with an easy-to-use one-stop-solution for trading PCL for the best price from all markets in just one place. “My Account” will enable you buying PCL-token from the exchanges in real time. 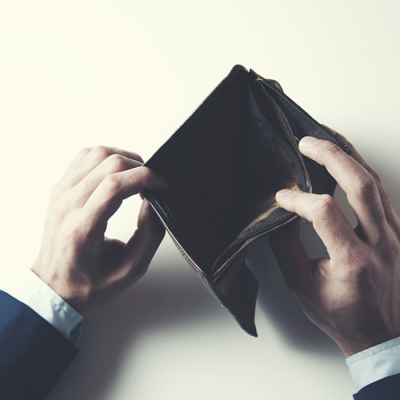 Why buying PCL is valuable? Use PCL to access “AskEve”, the best real-time prediction-product for cryptocurrencies with over 99% accuracy. Using PCL will reduce your fees for “BeliEve” by 50% (12,5% instead of 25% of the profits BeliEve gained on your portfolio). Access future products (more details to follow). 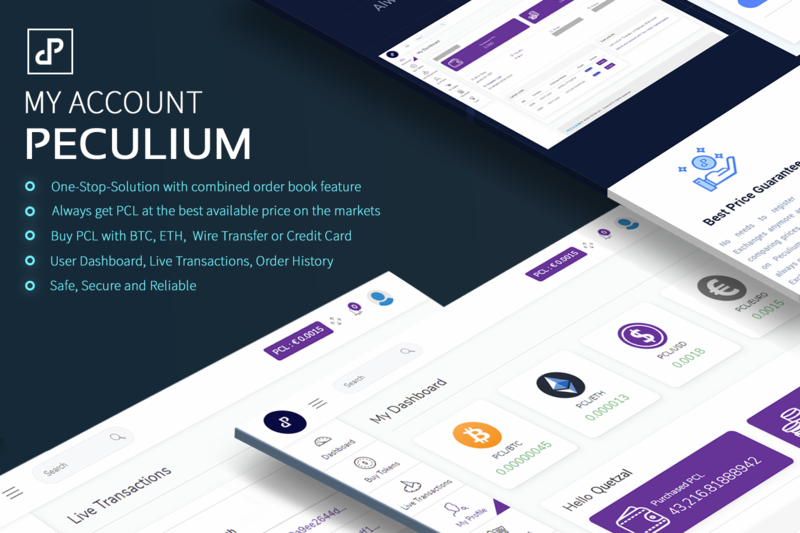 How to use Peculium My Account? By clicking on My Account you will be directed to the registration page. 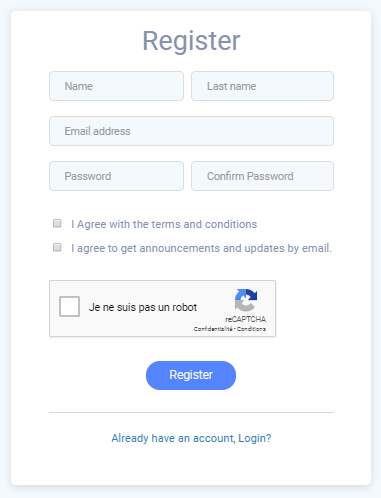 Enter your Name, Last name, Email address, choose a password and confirm it. Don't’ forget to prove that you are not a bot. Make sure to choose a strong password. Longer is better; use a mix of letters, numbers, symbols, and punctuation marks. 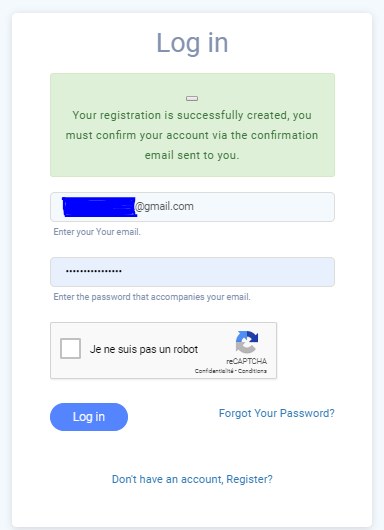 An email will be sent to your email address; to activate your account click Verify your address and your registration will be completed. 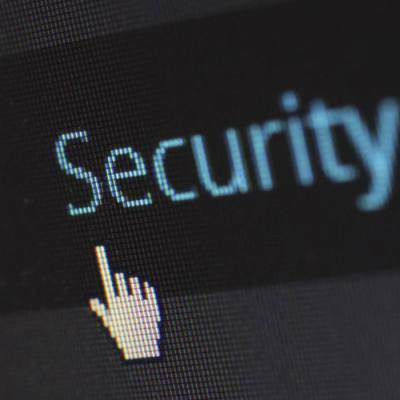 Your safety is important to us, please make sure to secure your account as best as possible. Check our instruction to enable 2FA over here. 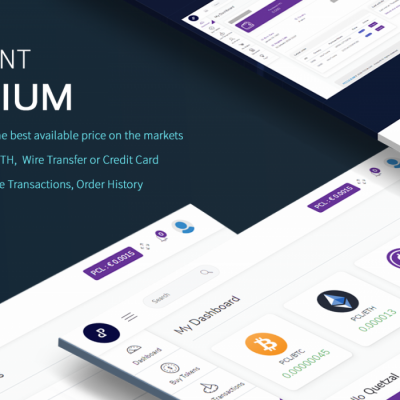 On the left hand you will find these tabs: Dashboard, Buy Tokens, Live transactions, My Profile, My Orders, Documents, and FAQ. provides an overview of the PCL value for four pairs: BTC, ETH, USD, and EURO. You will also find all your personal details as well as the amount of purchased PCL in the past and most recently ordered PCL. 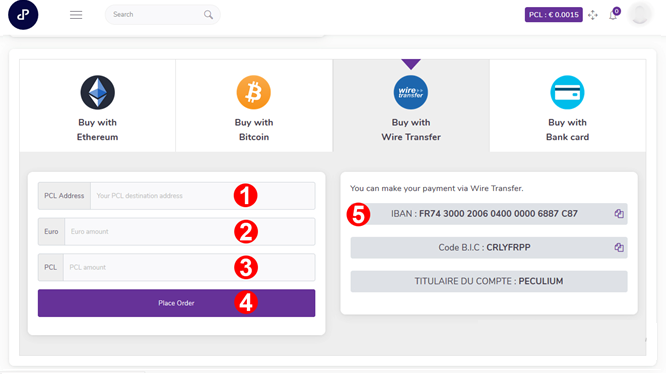 Through this tab, you can purchase PCL and choose in which currency you want to pay. Available payment- options are Ethereum, Bitcoin, and FIAT using wire transfer, and FIAT using Bank-Card in future. 1. Your ETH or BTC wallet address (where you will send ETH- or BTC from). 2. Your PCL destination address (where you want us to send/store your PCL to). 4. the amount of PCL you would like to buy. 5. Click “place order” and your new order will be created as “pending”. 6. 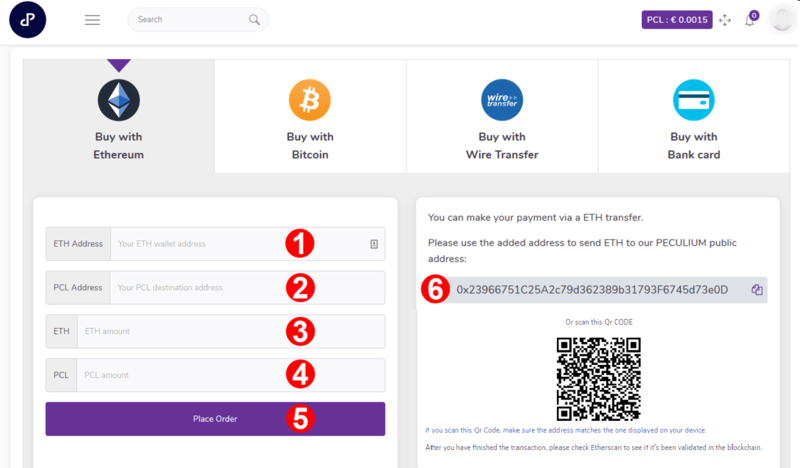 Now send the amount (ETH or BTC) according to your order to our wallet-address (step number 6 in the above picture). When receiving the ordered value, we will automatically validate your order and while checking it in “My Orders” you will see its status has changed from “pending” to “successfully” and the purchased PCL will be added to your balance (total purchased PCL). 1. Your PCL destination address (where you want us to send/store your PCL to). 4. Click “place order” and your new order will be created as “pending”. 5. Finally, send the ordered value via bank-transfer, please make sure to use the correct Peculium IBAN as the rest of the information below. Please make sure to send equivalent EURO value if you will later process in another fiat currency such as US-Dollar, our platform will only process your PCL equivalence in EURO. Buying with Bank Card will be available soon. P.S: PCL is an ERC20 token that should be stored in an Ethereum wallet, make sure to use a suitable wallet to not lose your PCL. This tab provides you with fully transparent access to all PCL live transactions. 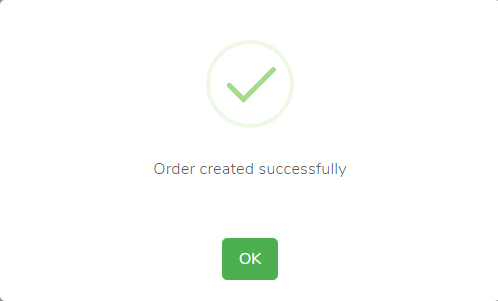 To check your orders´ status, if it’s still pending or successful already. 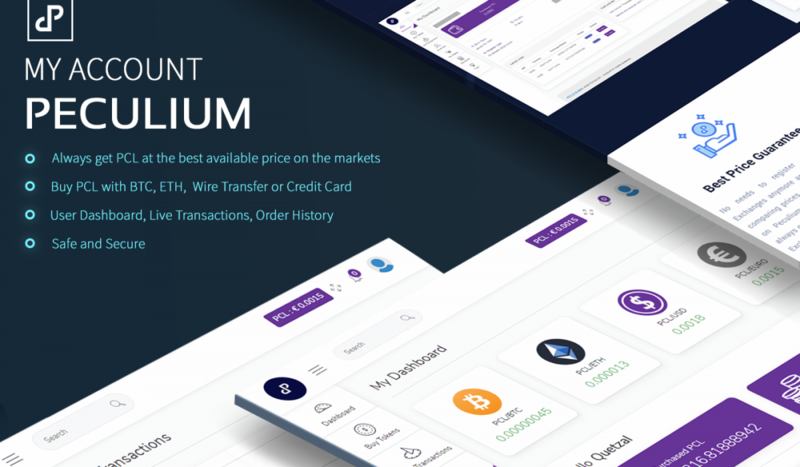 All Peculium documents are available here in one place. The frequently asked question tab you will find answers and general information quickly. We will keep updating the questions to make sure everyone will be well guided. 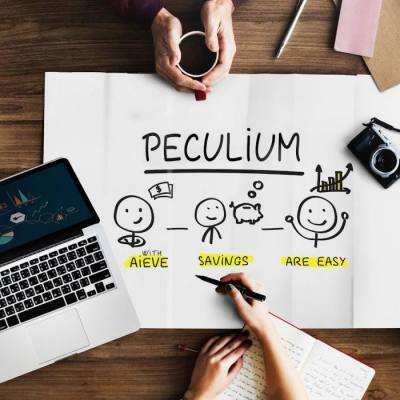 Become a part of our family and join Peculium on various social media channels to get the latest news and announcements from Peculium.